The Brandon Hall wing of the Knowles-Douglas Student Centre was constructed as the Brandon Citizen's Science Building in 1922–23. The building was to have been part of a larger science complex, but further construction was halted due to financial constraints at that time. 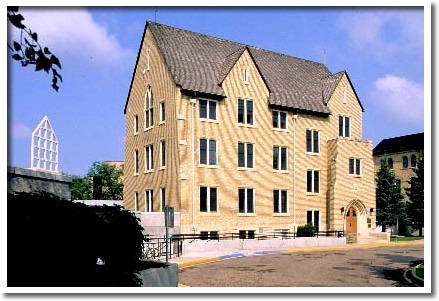 Built of locally produced brick and Manitoba limestone, Brandon Hall is the third of Brandon University's three original buildings. In contrast to the Romanesque styling of Brandon College and Clark Hall, the Science Building's Late-Gothic style, with its steep pointed roof and strong vertical features, make the structure seem taller than its three-and-half storeys and, as a result, the building fronts onto 18th Street with considerable prominence. The Brandon Citizen's Science Building was designed by Brandon architect David Marshall, and constructed by the Ebeneezer Claydon Company of Winnipeg. It was financed through private subscriptions in Brandon and throughout western Canada. The structure is an rare example of Late Gothic style architecture in Manitoba and an important architectural and historical landmark in the development of public education in Manitoba.